Space is the ultimate luxury. Space to live, to relax or just be by ourselves. No matter how much we have it never seems enough and this is doubly true in the bathroom. Connect Space is designed to help you get more out of your bathroom. So whether you need more elbow room, clever storage or an ensuite to ease the morning rush, the Connect range introduces a range of compact solutions. Connect Space is designed to help you use your space in smart new ways. 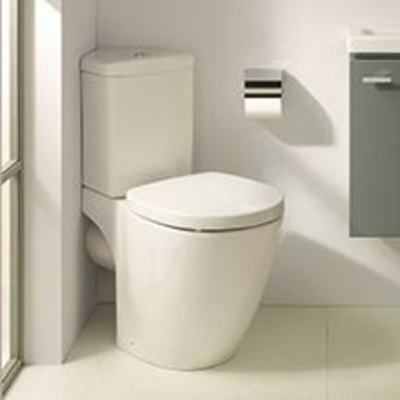 So if you have a bathroom that only has a limited amount of space, is an awkward shape, or you just want to gain some space to give you more freedom to move, Connect Space is your perfect answer. Because everyone’s space is different Connect was designed by Robin Levien to provide huge flexibility and choice. Connect Space is the natural development of that idea and adds another dimension to the Connect range. With clean lines and a choice of sizes, Connect Space offers stylish storage solutions. 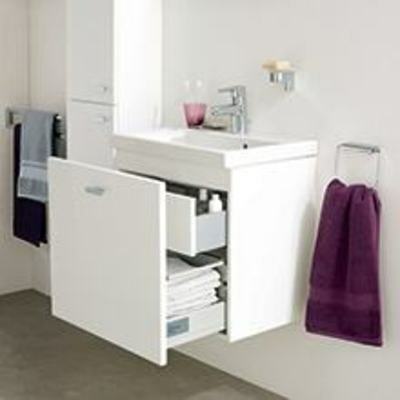 Basin units have innovative, L-shaped doors, with cleverly positioned storage boxes inside, open smoothly – without touching other units – to give you free access to your cupboard, even in the tightest spots. Bathrooms have evolved to suit our modern lifestyle – but many have awkwardly positioned windows and doors that mean that standard products don’t fit neatly. The Connect Space range includes the Spacemaker bath which tapers to fit around problems areas. Connect Space WCs all have shorter projection that is 6cm less than standard Connect WCs. Intelligent design like slimline furniture and clever corner solutions pack in the practicality whilst maximizing the space you have to move about. 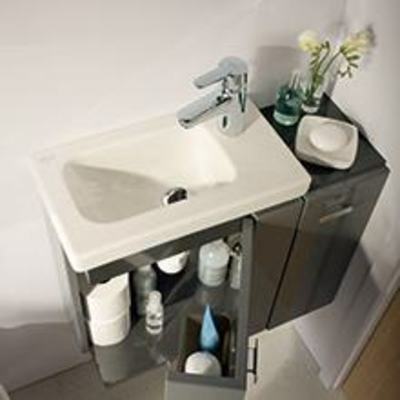 Connect Space basin units are supplied with a combination of loose internal storage boxes to fill half of the top drawer. Additional boxes are available to customise your storage. The Connect Space tall column unit is just 210mm deep but 1750 high. Glass shelves are included in the full height and there are two individual cupboards – so you can fill one with toiletries and leave the other for less glamorous items. Connect Space includes a new range of mirrored cabinets available in a choice of white or aluminium sides to complement all furniture finishes. You don’t need a small bathroom to take advantage of a mirrored cabinet and sizes range from 500mm to 1300mm.